the buzz around declining honeybees might recede somewhat. Researchers at the University of Warwick in the uk are studying ways to deliver a naturally occurring fungi into beehives to kill the varroa mite--one of the biggest threats to honey bees. The mite, which is native to Asia entered the uk in 1992 ravaging 30-50 per cent of honey bee colonies. Varroa mite feeds on the circulatory fluid of the pupae and adult of honeybees and transmits diseases to the honeybee reducing its life expectancy. This leads to a decline in the bee colony, which in turn affects the pollination of commercial crops and wild plants. Though pesticides can control the mite, it is gradually becoming resistant to it. Scientists have now started looking at the biological control technology option to manage the pest. According to Dave Chandler, a researcher at the University of Warwick, 50 different types of entomopathogenic fungi (fungi that afflicts other insects) were tested. The researchers have now zeroed in on four fungi. Identifying ways to introduce the fungi into beehives remains a challenge though. 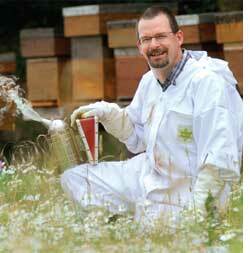 Scientists are mulling over options ranging from fungal footbath at the main entrance of the hives to powder sprays. The complex design of honeycombs could mean that more complicated ways of introducing the fungi may have to be put into use. Meanwhile, scientists at the University of Toronto have found another reason for the decline in pollinating bee populations. In a study published in the July 23 issue of the online, open-access journal PLoS ONE, Michael Otterstatter and James Thomson of the University of Toronto present evidence that commercially produced bumble bees used in greenhouses are infecting wild pollinators, thus leading to a decrease in the natural pollinating bee population.